The information is in Excel format. In case you're not familiar with how to navigate this type of document, the tabs for the tables are at the bottom. 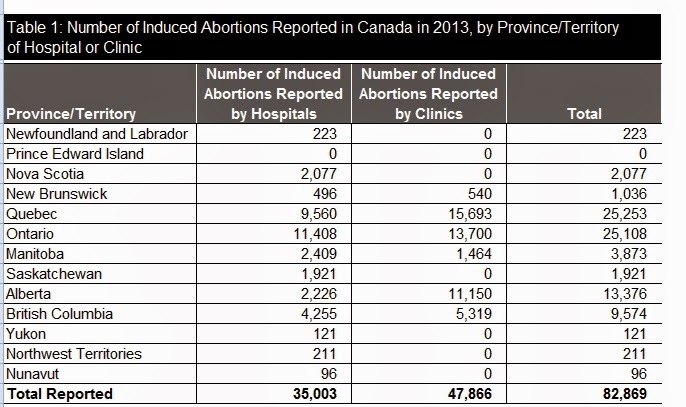 CIHI says that 82 869 abortions were recorded in Canada in 2013. Only abortions in clinics and hospitals were reported. CIHI explored the option of counting abortions by Fee-For-Service, but the data is not compatible across provinces. The information is also voluntarily submitted, so there is a risk that some clinics did not report. I suspect there are probably many abortions being conducted in private offices, especially due to the greater availability of chemical abortion. But we can't know if there was an increase or reduction in abortion because we don't have all the numbers. The only thing we know for sure is that there were at least 82 000 abortions in 2013. Table 4 provides an interesting little nugget of info. 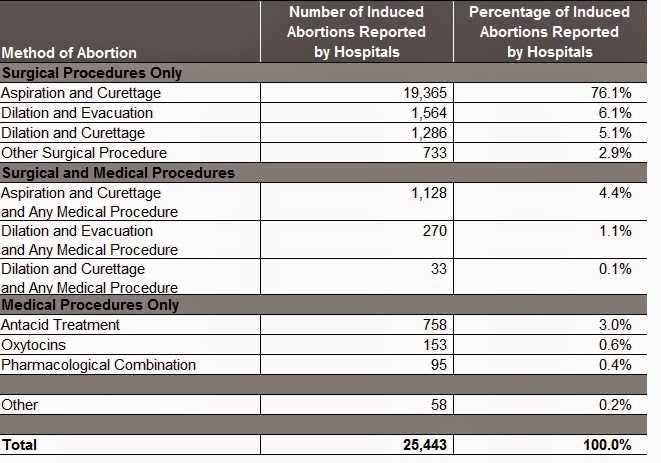 Outside of Quebec, there were 564 abortions performed at 21+ weeks in hospitals. That's 2.2% of all abortions done in hospitals outside Quebec. That's approximately 0.7% of the 82 000 total. It's interesting, because that's almost certainly underreported. Late-term abortions are done in Quebec, and there's a clinic in Montreal-- CLSC des Faubourgs-- that specializes in late-term abortion. Late-term abortions are often not recorded as abortions, but as stillbirths, because the technical definition of an abortion is the termination of pregnancy before viability. There are almost certainly many dozens more late-term abortions than are being reported here, probably hundreds more. Table 7 has some interesting information on method of abortion, because they categorize methods according to whether surgical, "medical" or surgical & "medical" methods are used. I suspect by "medical" they mean chemical. They mention in the medical procedure the "Antacid Treatment" which I found surprising as a category. I suspect they are referring to the use of Misoprostol or similar drugs that are known as antacids. Thanks to Run with Life for keeping an eye out on this information.